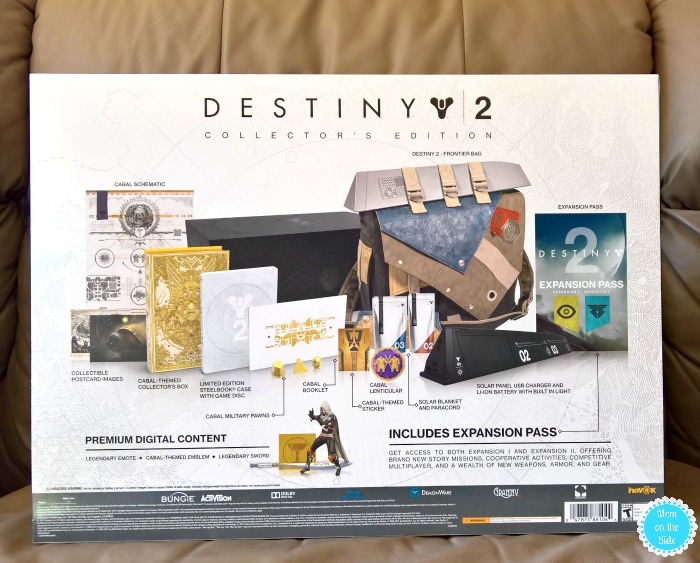 Thanks to Activision for providing us with a Destiny 2 Collector’s Edition Box and the Destiny 2 game. Any opinions are 100% my own. This post contains affiliate links. Having an 11-year-old son means video games are a big part of my life. Watching him show off new skills, seeing his face light up when he beats a level and listening to him oooh and aww over the graphics on Destiny 2. I gotta admit, they are pretty epic. 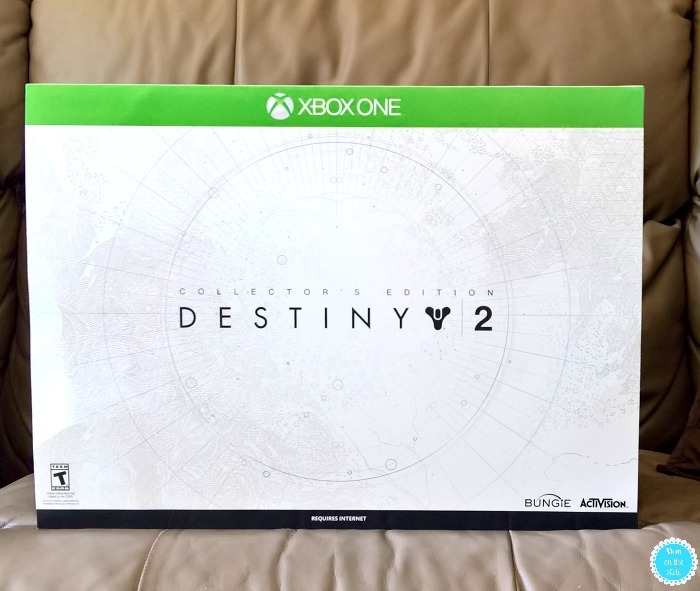 Now available for PS4, XBox One, and PC, Destiny 2 is a first-person action game created by Activision and Bungie and they sent us a Destiny 2 Collector’s Edition Box to celebrate the release! 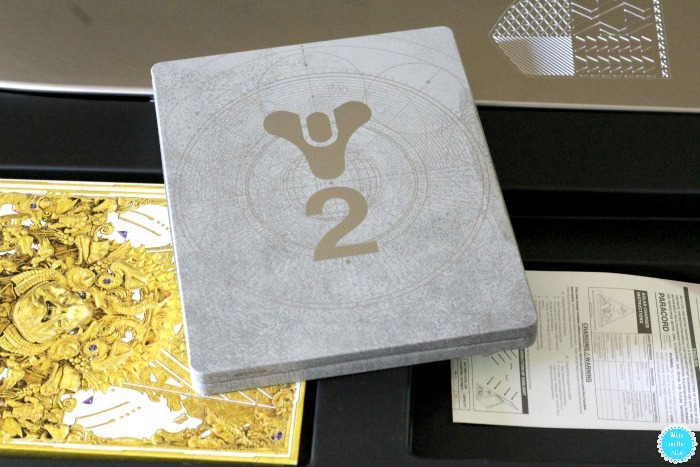 As soon as my son arrived home from school he dug right in the Destiny 2 Collector’s Edition Box. 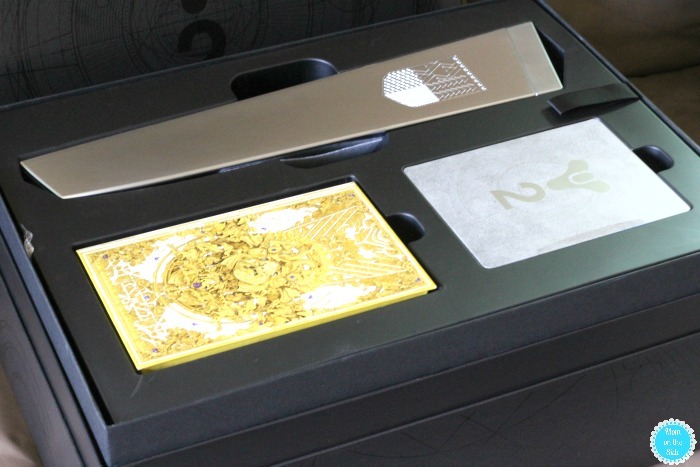 First thing we opened was the Cabal-Themed Collector’s Box. 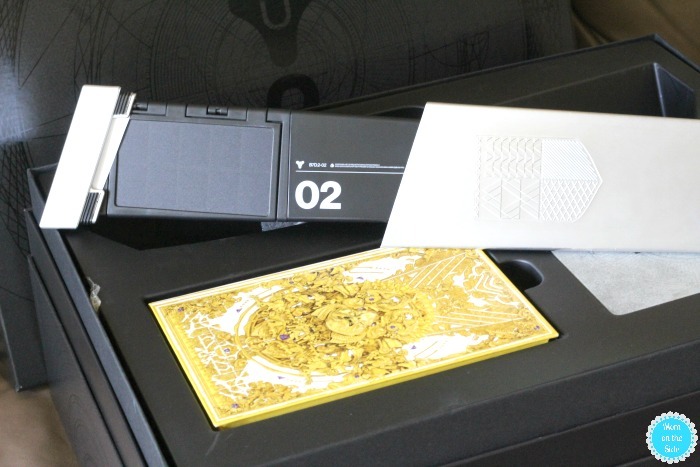 Inside were Collectible Post Card Images, Cabal Schematic, Cabal Military Pawns, Cabal-Themed Sticker, Cabal Lenticular, and Limited Edition Steelbook Case with Destiny 2 game . I need to get better pictures of the paper items but you can check out the rest below! 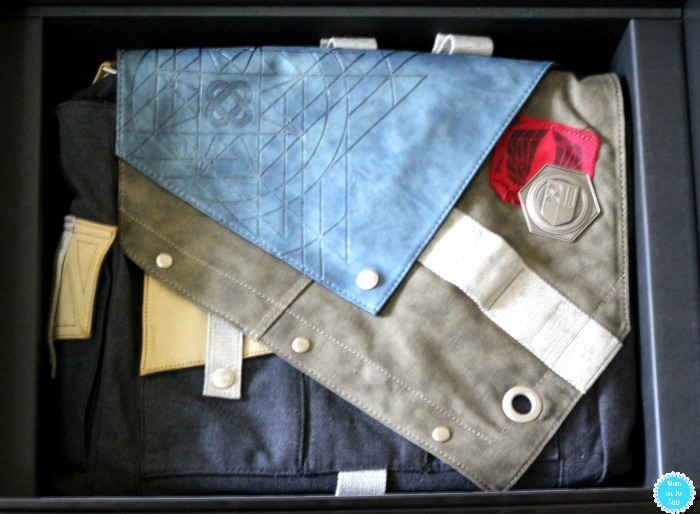 My son’s favorite part of the entire collector’s edition box was the Destiny 2 Frontier Bag. So many pockets and heavy duty material that make it great for all those outdoor excursions teenage boys go on. The Frontier Bag even has a space to carry the Solar Panel USB Charger and LI-ION Battery with Built-In Light! At first, I thought this thing was a sword based on its shape! It comes apart into three pieces and includes a solar blanket and paracord. We’ll be checking those out soon and will report back on their awesomeness. 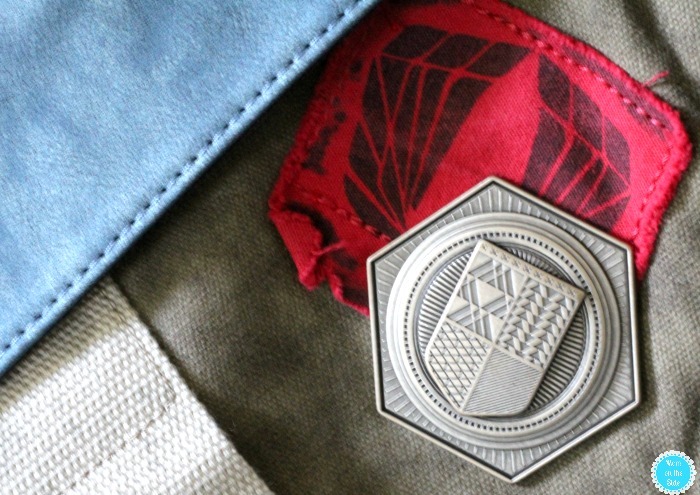 A Destiny 2 Collector’s Edition Box wouldn’t be complete with some awesome game extras. The Destiny 2 Expansion Pass gives access to both Expansion I and Expansion II that offer new story missions, cooperative activities, competitive multiplayer, as well as new weapons, armor, and gear. Other Premium Digital Content includes a legendary emote, cabal-themed emblem, and legendary sword. In Destiny 2, humanity has fallen to an overwhelming invasion force, led by Lord Ghaul, the imposing commander of the brutal Red Legion. He has stripped Guardians of their power and forced the survivors to flee their homes. Players will venture out into our solar system to discover an arsenal of weapons and devastating new combat abilities. To defeat the Red Legion and confront Ghaul, they must reunite humanity’s scattered heroes, stand together, and fight back to reclaim our home. 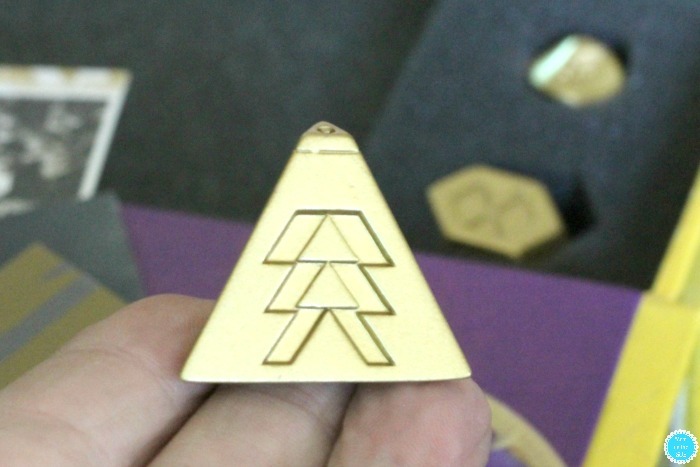 Action, Adventure, and Gameplay for ALL Types of Players: Play the Story Campaign, Strikes, the RAid, Adventures, Lost Sectors, Public Events, Flash Points, competitive 4v4 PvP gameplay in The Crucible with new modes and maps, and experience other new features including the Clan creation feature and “Guided Games”. Four New Stunning Worlds to Explore with New Features: Adventure to the vast reaches of the universe in the European Dead Zone, Titan, Nessus, and Io. All New Director: Your guide throughout Destiny 2 in your search for Adventures, Lost Sectors, new Public Events, and more. Players can pick a landing zone, explore, and seamlessly jump into other activities in the game. Customize Your Guardian: Three new subclasses to choose from with more gear than ever bear to earn and equip. A NEW Destiny 2 Raid will be available at 10 AM PST on Wednesday, September 13th!